Actual screen shot from ebay this morning. Shipping and power supply not included. I don't understand what the ~game~ is behind doing that with prices. I see that tactic used all the time on eBay and elsewhere. There can't really be anyone that stupid with access to that much money who would actually buy a $125 stomp box for $12k. I've been befuddled at what the purpose behind that ~game~ is ... there's got to be some type of tactic or scam or ??? behind doing that, I just can't seem to work out what is going on with that. I mean, I can sortof rationalize the whole $5k Klon thing ... but beyond that, this boggles me bucket! Here, where I live, on a latinized version of ebay, we have a bunch of outlandish prices for the most inane gear. One of my favorite listings is a Gibson GA5 amp selling for over US$5000 - from time to time, the seller varies the price, but the amount is always surreal. Its been on sale for almost four years now, with tons of disparaging comments. What drives such ludicrous listings is beyond me. All of a sudden Meris pedals look pretty cheap. Made in USA even. Wife: "When are you going to sell those guitar toys you haven't used in ten years?" Husband/gear hoarder: "But honey, I have them on eBay, I really am trying to sell some of them ... just for you my sweet!" Wife: "Why aren't they selling?" Husband/gear hoarder: "Why I'm not sure, Dearest ... I'm trying my best." 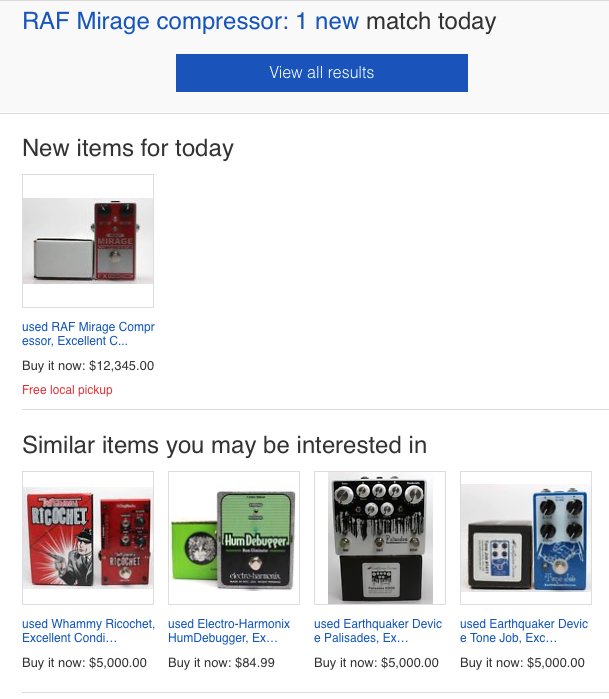 Meanwhile, the stomp box worth no more than $100 that "husband/gear hoarder" has priced at $6,000 sits unsold, as does the rest of the gear he has no intention of selling which he's priced at completely unreasonable amounts. His conscious completely clear, he sleeps well by telling himself he's not lied to his spouse. Tune in next week for the next episode of "How To Manipulate Your Wife Into Allowing You To Keep All Of Your Old Gear". These outrageous eBay price stories are an endless source of amusement in fora, but your explanation actually makes a ton of sense. The apogee of idiocy is old germanium FuzzFace. How is the germanium fuzz face idiocy? I own a "Joe Bonamassa" Mini Fuzz Face, along with at least a half dozen DIY/custom fuzz face units. I really like the "Joe B", it sounds much different than the others, and in this case "different" equates to "good". So whuddup? Huh? Wutchyoo talkin' bout Willis? FESS! Oooohhh .. you mean stupid prices slapped on ancient pedals that stupid people pay ... cuz mojo ... 'n cuz reasons! Ok, yea, I'll go along with that. Claim of idiocy granted. Carry on. I did not want to disturb anyone. I'm talking about this idiocy. Few years ago the price was around 800$, a disaster. Surprised nobody's mentioned the possibility that this price is just being set by an algorithm that was behaving badly due to some random stimulus it wasn't designed to expect. There's the well known algo where two used book sellers compare each others prices. One seller has the book in very good condition so marks his price up against the other one. The second then sees his book is now too cheap, so increases his price. And so on..
A holding price sounds more likely ! Good call, I suspect you're correct. Perhaps sometimes people click "buy" by accident and that's the strategy? You see this kind of pricing on Amazon sometimes too.